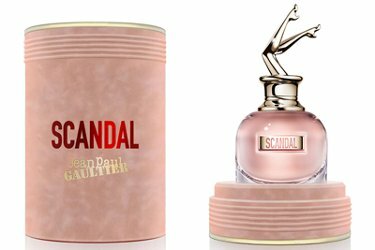 The basics: Scandal is the latest from Jean Paul Gaultier, and it purports to be a honey chypre combining an 'elegant aura' with the 'spirit of Pigalle', and reflecting the designer's "vision and feeling about femininity".1 It's the brand's first pillar under licensing arrangements with Puig. What it smells like: It goes on SWEET and LOUD, and it stays that way for the duration. There is an overload of honey, without, to my nose at least, the undertone of urine that sometimes creeps into honey fragrances. There is some bright but flat citrus in the opening and an awful lot of bubblegum-ish fruit. It's joined very quickly by a heavy floral note, sorta / kinda gardenia-ish, I guess, but also sorta / kinda just pinkish perfume flowers, lightly spiced. There is a darkish, woody amber base, mostly clean, with just the lightest dusting of a powder finish. It's not dark enough, or heavy enough on the patchouli, to qualify Scandal for fruitchouli status, and there's likewise plenty of vanilla but it's not creamy enough to qualify as a comfort scent. I wouldn't quite call it linear, but it's close; it has a modern, "no flowers died in the making of this perfume" feel. The lasting power is amazing. My verdict: There is a sea of heavy and sweet fragrances out there already, and while Scandal did not remind me of any one of them in particular, it reminded me of all of them — that is, it smells very "on trend". I like some unoriginal sweet perfumes myself, but it's not my favorite category and I found Scandal annoying to wear: it just feels clunky to me, for lack of a better term. I felt a mild dislike on the first wearing; by the third outing, I pretty much hated it. If you're a fan of the genre, do give it a shot. I'd say the reviews are mixed, but it has certainly found fans. 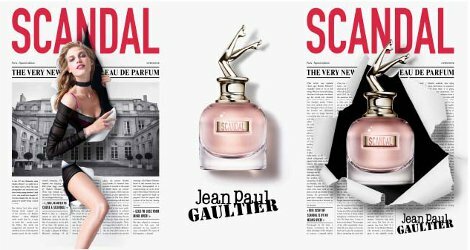 The details: Jean Paul Gaultier Scandal is sold in 30, 50 and 80 ml Eau de Parfum and in matching body products. It is on counters over the pond, but will not launch in the US until 2018. Update: oops, perfumers Fabrice Pellegrin and Christophe Raynaud also worked on Scandal. 1. Via "EXCLUSIVE: Jean Paul Gaultier Creates Scandal" at Women's Wear Daily, 6/15/2017. I have not found it any easy thing to scrub off, either — all the times I wore it, I could smell it on clothing I wore *after* I’d showered it off. I laughed so hard at not being able to stop the whole 24 hours coming out at once! Great review. I will give it a try if I see it. Thirds! A really good laugh was had here. Great review Robin. I wish the legs spun around and music played like on those ballerina jewellery-music boxes kids used to have. I wish someone would come up with an ‘in bed by 9pm with a book and a cup of warm milk’ scent. Oh, it would be way better if it were a wind up music box! I think a good half of my collection is ‘in bed by 9pm with a book and a cup of warm milk’ — wearing Prada Candy right now (exactly the sort of unoriginal sweet fragrance I like) and it fits! For some reason I thought that it was a review for some old(er) release (I could swear I’ve seen already those legs – and, judging by your review, this is the most scandalous part of that perfume). Even though I do not plan to ever test it on skin, I enjoyed reading your review – thank you for the smile. There was a Revlon scent called Head over Heels with legs sticking up? And I think I heard of another but now I don’t remember what it was. I just can’t get past the legs copying Head Over Heels. Its so sugary and sweet. When I smelled it, I immediately feared the dentist hahaha. Agree, but there really are some terribly sweet scents that I do love so I hate to diss it on that score! I just did not find it appealing at all. Agreed, sweet can be nice! But this one was just ‘flat’ and also too shrill and agressive sweet.